Our BA Geography and Management degree allows you to study key specialisms in human geography together with management modules, which will develop your understanding of how organisations function and the role of the contemporary manager. Modules at Level 1 introduce key themes in human geography and management, focusing on topics including the economic and social importance of cities; international development; the unequal distribution of power and opportunity in national and international systems; geographical and managerial perspectives on business performance and decision-making. At Level 2 you will choose from a larger number of optional modules - including those focusing on economic geography, political and development geographies, social geography, urban geography, marketing, international business and business law - so that you can begin to specialise in the ideas and issues that interest you most. Module choices in Geography include a range of week-long fieldtrips to European cities. We will also help you to develop your own skills as a researcher, with modules that show you how to access, analyse and present information; how to pose your own research questions; and how to identify the best methods to answer your research questions. At Level 3 you will have the chance to put your research training into practice, by undertaking your own final year project. You can choose whether your project has a geographical or business focus, and there are opportunities to pursue applied projects with outside companies and other partners. You will also choose from a range of advanced optional modules, allowing you to deepen your specialist interest in particular aspects of human geography and management. Module choices in Geography include a range of international fieldtrips. The programme includes the option to spend a year studying abroad, or on an industrial placement between Levels 2 and 3. The programme is also available to study part-time - this means that it will take a little longer and you will study fewer modules each year. You’ll learn through a mixture of lectures, tutorials (groups of about eight), seminars (groups of approximately 30), computer classes, lab practical classes, group-work, online exercises and fieldwork, depending on the modules you study. Opportunities for extra help, including “drop-in” workshops, one-to-one assistance, and an extensive programme of generic skills training. Studying at university will involve you in taking increasing responsibility for your own learning as you progress through your degree. Developing the skills to think and work independently will be crucial to your success both at university and in your future career. Independent study involves a lot of reading around the subject, and although this may seem daunting at first, we will guide and support you. Assessment methods vary from module to module, helping you to develop and practice a range of skills. Types of assessment include: examinations, individual or group reports and presentations, practical exercises, essays, posters, projects (such as the dissertation) and reflective logs. If geography is not offered, we would expect two from biology, economics, English, history, mathematics, a modern language, psychology and sociology. Offers do not include general studies or critical thinking. GCSE: English and Mathematics at grade B (6) or above, or an equivalent English language and Mathematics qualification. 35 points overall, with 18 points at higher level to include 5 points in Geography or in two relevant subjects. We accept a range of international equivalent qualifications. For information contact the School of Geography Undergraduate Admissions Team. Read advice on how to apply on the School’s website. Field classes are optional for BA students. We currently allocate £500 per student towards the cost of optional field trips across levels 2 and 3. Additional costs may be incurred. The School of Geography offer a range of scholarships for Home, EU and International students. Scholarships for 2019 entry are to be confirmed. We take your future very seriously and know that employability is uppermost in many students’ minds. 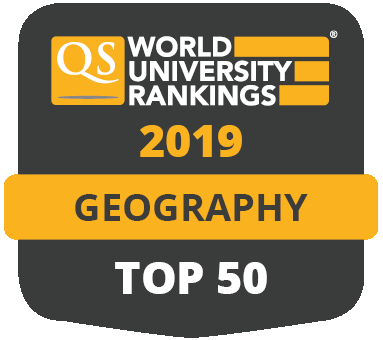 If you choose to study Geography and Management at Leeds, you can be confident that you’re not only joining a university whose graduates are targeted by top employers, but that as joint honours graduates, your employment opportunities couldn’t be more exciting and wide-ranging. At Leeds our aim is to ensure our students thrive in their academic studies and leave us as highly employable graduates with a wide range of skills and attributes sought after in today’s job market. Leeds is one of the few geography departments in the UK to offer a year in industry scheme which allows you to extend your three-year programme to a four-year industrial degree. You don't have to decide to do a placement year before you start your course, you can register your interest with us once you’ve enrolled on the 3-year degree. We offer BA field trips at each level of study and they provide a great opportunity to study a fascinating subject in contrasting environments away from the University. During the field trips you will learn essential fieldwork and team working skills, transferable skills that will prove invaluable to your future career. Field trips are also a fantastic way to travel and see new places and to get to know your tutors and other students better.